mundane jane: How a college degree can go so terribly wrong. How a college degree can go so terribly wrong. (2) I don't like to pay full price for anything. In fact, I may very well be the most carbonated cheapskate on the planet. So, when heading to the settlement for supplies, I like to have a plan. Since I am going to need to restock soon, I took a break from grading papers Saturday to peruse the Kroger circular. I know from experience that big-meal holiday weekends are the best time for getting the most bang from your Diet Coke dollar. Sure enough, Kroger had Diet Coke on sale in all its incarnations. But I got all waylaid when I stopped to consider, which was the better deal? There are 12 ounces of Diet Coke in one can and 33.8 fluid ounces in a liter. Thus, in a 2 liter bottle there are (33.8 x 2) 67.6 fluid ounces. 67.6 fluid ounces / 12 ounces per can = 5.63 cans of soda in one 2 litter bottle. 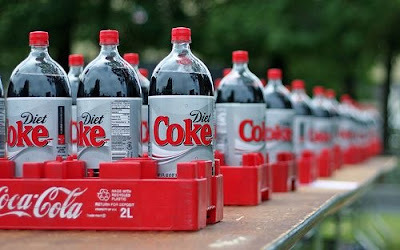 Diet Coke 12-packs are on sale at 3/$11.00, which is $3.66 for a 12 pack, less my $1.00 coupon/2. If I use my coupons to buy the canned Diet Cokes, I will pay $1.33 per 6-pk. The 2-liter bottles of Diet Coke (5.63 cans) are on sale for 4/$5.00, and I have no coupon for those, which means that I will pay 1.25 per 5.63 cans'-worth if I buy the 2-liter size. And this is as far as my liberal arts degree will take me. I can't figure out if that final .37 can's worth of diet coke is worth the 8 cents' difference. I need someone with a Ph.D. in economics to get on the horn and tell me whether I should buy the 2-liter bottles or the 12-pk cartons. And as long as I am soliciting opinions, can someone shed some light on why I should feel compelled to split hairs over 8 cents that I would not even go to the trouble of fishing out the bottom of a handbag before donating it to Goodwill? It is this very compulsion--to shave minute units of measure off an already-negligible difference--that has prompted Muffin Uptown to ban me from ever asking, "what's quickest way to get there?" Which becomes all the more imponderable if you happen to know that I made my new-car choice based on the color the dealer had in stock at the time. Serendipitous postscript: Chocolate bunnies are 25% off. Incredibly cruel postscript: More than one person has since asked me, "Did you not know that price-per-unit info is posted there on the shelf?" Cost per unit is sometimes misleading. Don't trust it. If it is close, the better deal is the six pack. Not because of the actual cents difference, but because you will get six servings out of a six pack, and will not get that many out of a bottle, unless you cup is exactly 12 oz, with ice. That is how *I* do math, anyway. And yes, my degree is in English. How could you tell? I'd go with the cans. There's just that wonderful feeling of popping a new can and getting all the fizziness as you pour the lovely nectar of the gods. Nothing can compare to a NEW can of Diet Coke! And this is from one of the biggest cheapskates around. Mary just about hit on my problem with big containers. They lose their carbonation way too soon - unless your guzzlin'. So, even though it might be cheaper in the 2liter bottles there is a good chance by the time you get 2/3 finished you are wishing you'd gone with the cans. Ah, the great mysteries of life. You can't put a price on the fact that the soda in the liter will be flat before you finish it. Cans FTW.